Romney sleepover 2016: Christie, Rubio appearing in same Fourth of July parade in New Hampshire. 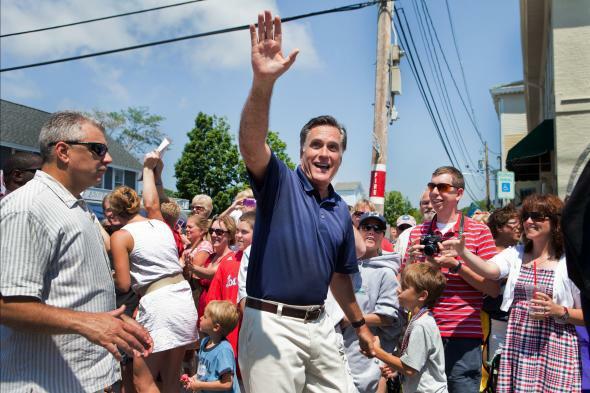 Mitt Romney works the crowd at the Wolfeboro, New Hampshire Independence Day parade on July 4, 2012. On Saturday morning, GOP primary rivals Chris Christie and Marco Rubio woke up under the same roof as they prepared to march in the same Fourth of July parade. And when they made their way downstairs for breakfast, they were likely greeted by a man who, in 2012, walked the same route in the final months of his own presidential campaign. The Washington Post reports that Christie and Rubio joined Mitt Romney for a sleepover Friday night at Romney’s Wolfeboro, New Hampshire vacation home. Both Christie and Rubio are set to appear Saturday in the local parade, one of the better-known Fourth of July celebrations in the early primary state and a perennial event for the Romneys. The Post’s anonymous tipster, described as a Romney aide, said the former Massachusetts governor and his wife had “opened their home to their friends and look forward to celebrating America’s birthday.” Just friends, mind you, not prospective endorsees: Time notes that Romney pledged at his “E2 Summit” in Utah last month, attended by Christie and Rubio, along with other would-be presidents, that he doesn’t plan to pick sides in the 2016 GOP primary. Gov. Christie told a New Jersey reporter Friday that he, his wife, and two of his four children would be crashing with the Romneys and predicted there would be “a little politics discussed tonight with Mitt and Ann.” The Romneys, he said, had reached out to invite them after Christie signed on to march in the parade. Rubio’s campaign declined to comment to the Associated Press about his Wolfeboro plans, but Rubio advisor Jim Merrill—also a veteran of Romney’s 2008 and 2012 campaigns—tweeted a photo of the Florida senator and his wife with Mitt on Friday evening. There’s no word whether the candidates will declare the stay at the Romneys’ six-bedroom lake house as an in-kind campaign donation on their next round of disclosure forms, or whether the extra guest house was used to put up Gov. Christie’s protective detail, whose taxpayer-funded travel expenses have become a sore spot for voters back home. Eighty-two percent of New Jersey voters in a recent poll said Christie’s campaign should be paying the extra costs of taking New Jersey state police officers and vehicles to his many out-of-state campaign events, which reportedly cost the state upwards of $185,000 in the first three months of 2015. Christie has so far refused, saying Wednesday that “we’re going to continue to conduct this in the same way I’ve always conducted it,” with the state footing the bill.